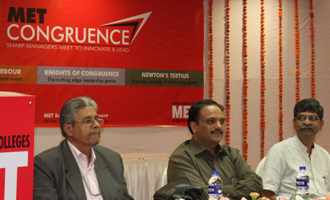 MET Schools of Management hosted two day mega intercollegiate meet ‘MET Congruence’ on October 5 & 6, 2010 at the MET Convention Centre. The meet was inaugurated by Trustee - MET League of Colleges. This B school meet had featured events like the Olympian Harbour – The mega management event, Knights of Congruence – The cutting edge leadership game and Newton’s Tertius – Business strategy & innovation game.